Let’s start off the 2016 gift guides with a bang! 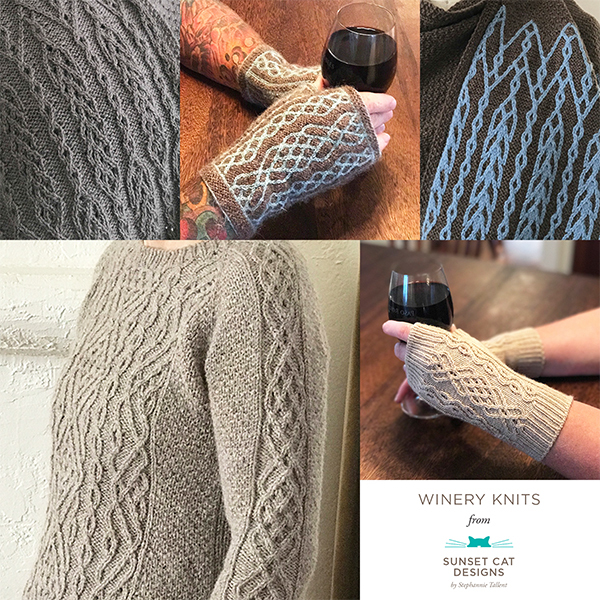 These are the sweater designs I’ve chosen from designers participating in the 2016 Indie Design Gift-A-Long that I just love, for reasons detailed below. I wanted to publish this guide first, because these are projects that will take a bit more time. Okay, the geek in me just adored the space ship and droid motifs on these sweaters. Both versions include schematics, charts, and detailed photos of pertinent design details. Detailed info on sizing is given, included intended ease, ease shown on the model, and more. If you need to make adjustments for fit, Marnie has comments and tips in the appropriate sections. Both imperial and metric measurements are included. If you’re working on the pattern from your computer, there are hot links that take you from the instruction (work chart p 5 for example) to the chart itself. At first glance it’s a lovely traditionally constructed Aran pullover — then you see the wobbly, wandering cables. I love the front of this sweater! It’s a clever use of interweaving and interlocking different cable patterns, and ensures you’re not going to get bored at all knitting this sweater. Kirsten’s pattern, noted as unisex, ranges in size from 42″ – 62″ chest, and includes individual charts for the back stitch patterns, and a full chart for the front of the sweater as worked. Schematics and detailed photos are included. It’s written to be worked flat and seamed, but in the Ravelry pattern description she notes you can adapt it to work it in the round. I want this sweater. I have a couple French Sailor pullovers from LL Bean, that I wear all the time, and I like the looks of Jane’s sweater a million times more. I know I say I live in Southern California and I never get to wear knitted objects, but this I would. The pattern ranges from a finished size 34.5″ – 54.25″ chest and includes a schematic. The layout, due to the detailed chart including all measurements and stitch counts for you to enter into the appropriate sections in the pattern, is extremely clean and readable. Once you’ve entered your data in the pattern, there’s no confusing long lists of stitch counts to deal with. I just love the marching elephants around the yoke. Depending on your color choice, you can make this dramatic or subtle. Chest sizes range from 34.5″ – 53.5″. The pattern includes a schematic and detailed photos of the sweater’s design features. It’s worked from the bottom up, and the sleeves are joined to the sweater body at the yoke. As a Big Lebowski fan, I must admit that there was no way I wasn’t going to love these sweaters. Add in the gorgeous, movie-pertinent photography by Kathy Cadigan, and a decorative back drop of a Persian rug that ties the whole pattern together, and you’re in for a visual treat even before you start knitting. The Little Dude is sized from newborn to ages 10-12; The Knitter’s Dude ranges from 33″ – 61″ chest. Detailed schematics, charts, and tips are included in both patterns. The layout balances fun details (rug, bowling pins) with a clean, easily navigated layout. Both patterns include knitterly details such as tubular cast ons and bind offs (directions given for both). Steeking is required for both, as both are worked in the round.